The Milletseed Butterflyfish (also known as Lemon Butterflyfish) is flat and tall, so it can easily swim in and out of crevices within the coral reefs. These fish are mostly yellow with blue markings block dots. The dots serve as camouflage. This fish is native to Hawaii and is the most prominent fish in the Hanauma Bay region. It is mostly active during the day. Males and females are both about 4.7 in. but can grow to 6 in. 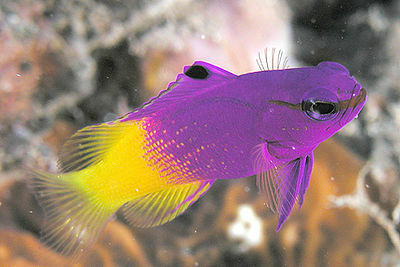 Tangs may be aggressive toward them in a fish tank. The minimum tank size is 80 gal. Their preferred food is zooplankton, but they will accept most aquarium foods. They should preferably be fed foods which have color-enhancing and vitamin-enriched ingredients to help prevent the loss of this fish’s bright yellow color, which tends to fade in captivity.